The public outcry and dissension within and outside the ruling coalition against proposed amendments to the Right to Information Act has compelled the UPA government to indicate its willingness to consult all stakeholders for any changes in the Act. 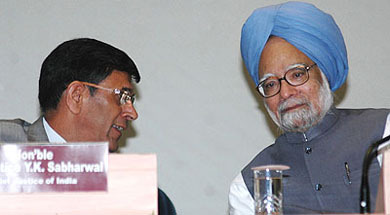 Prime Minister Manmohan Singh today said the judicial system needed to be more sensitive and humane towards the poor in the face of rising litigation cost so that doors of justice were not closed for them and assured his government's full support to the judiciary to achieve this objective. Do MPs deserve higher salaries? Among our nuclear scientific establishment, sections of the media and academia and some of our political parties, both on the right and the left, there is an understandable fear of the Indo-US nuclear deal getting India entrapped. The Punjab Government, incapacitated by the Supreme Court stay on allotment of industrial plots in Mohali over a dispute on the change of land use plan, has moved the apex court for permission to allot 64 acres of land to the TCS and Wipro to set up their units there as part of Chief Minister Amarinder Singh’s initiative to develop it as a major IT hub. The Indian Air Force (IAF) has launched investigations to determine the identity of a flying object which almost came close to the International Border in Rajasthan sector forcing a scramble of main line fighter jets MiG-21s for a possible cross over by a jet from Pakistan. You have to make some difficult decisions as a captain. It is not always easy. It sort of comes with the job. Several thousand people rushed to the sea behind Mahim dargah in Mumbai on Friday night after word spread that the usually salty water had turned sweet. The first Thar Express operated by Indian Railways crossed the border into Pakistan today after a delay of more than six hours at Munabao station in Rajasthan’s Barmer awaiting clearance from Pakistan railway authorities.